— We are all slaves to something. It might be our own egos, it might be an idea, and it might be a group loyalty. But what separates Christians from the world, is that we are slaves to Jesus. That means we seek the will of God in everything we do, even when it conflicts with egos / ideas / group loyalties. Is America, truly the land of the free? Let us examine this important question for a moment. On the one hand, part of our Constitution is called the Bill of Rights, which guarantees us many freedoms. We are free from having a tyrant as our permanent leader. The President only gets eight years maximum and is elected by the people. We are free to live in any state we wish. We are free to worship God as we see fit. We are free to try out different career paths and different kinds of jobs. We are free to have our own opinion and to express our opinions publicly. And the list goes on. America seems like a free place in many ways. On the other hand, according to a study published by Experian this past January, Americans have an average mortgage debt of $201,811.00. Americans also have an average of $24,706 dollars in non-mortgage debt and an average balance of $6,354.00 on credit cards. This is not good. In fact, Proverbs 22:7 says, “The rich rule over the poor, and the borrower is slave to the lender.” In this sense, Americans are NOT free, by our own choice. Also let us consider the simple American tradition of growing and cutting our lawns. Every year, millions of Americans put weed-n-feed fertilizer on their lawns and then proceed to complain about cutting the grass all the time. When I was in Malawi, Africa a few years ago, I realized that several locals had visited America for various reasons. I asked them what they thought. They enjoyed many things about America, but they were confused about why we grow grass when we don’t even have any animals to graze on the lawns? It is a little nuts. In a sense, we are a slave to our neighbors, because if we don’t take care of our lawns, or have nice looking properties, our neighbors will think we don’t care about us and get us in trouble with the municipality. In this sense, Americans are Not free, by our own choice. My point is this: Even when we are given freedom, we willingly choose to serve a master. No humans are exempt from this problem. If you do not serve the banks, or your yard, you serve your appetites or your ego or a human master. It seems like it is impossible to get away from serving something. Humans must have a master. This is because God created us to be in a relationship with him. Like a slave, we are totally dependent on the will of God for our existence and our joy. Except unlike a human master, God always has the best interest of God’s people in mind. God wants to give us the very best, and that is why God personally leads us! God is not an oppressive taskmaster, but God knows that we need Him in our lives. That is because God is the only master in the universe worth serving! Serving any other master will result in vanity and broken relationships. But wait one minute! I was just reading the scripture passages for today a minute ago and I didn’t like what I was reading about serving God! In fact, When God walked the earth as Jesus Christ, God purposely irritated the leaders of the day! And they plotted to kill him! What about the apostles? I am thinking that they were in for the same fate as their master! In fact, many of them were put to death for serving God! Why would I want that? In addition, Paul, the Apostle who went out into the Greek world, talks about serving God and being hard pressed on every side, and carrying around the death of Jesus in our body! I don’t like the sound of that! After reading these passages, I would not blame you if you disagreed with me about following God. Perhaps there is a less difficult, easier master our there to serve, like our front lawns. At least our lawns don’t make us carry death around inside ourselves! Or maybe the banks are easier masters. After all, they give us so many rewards points for being their servants! How nice is that? Well, as one who struggles to serve God, just like you, I can tell you with good conscience that God is the only master worth serving. I can present three reasons why God is the only master worth serving. This makes me think of Genesis 1, God created the world, and made the light to shine in the darkness. This is the God who created us and said, “It is very Good.” This is the same God who created us again in a new way in Jesus Christ. In other words, Paul must spread the good news about Jesus, because Jesus is God for us, and God is the best thing in the universe. Why else would he endure hardships to tell people about Jesus? God is the only master worth serving is because God is the only thing in this creation that is truly good. And God made a way for us to call God master, when we follow Jesus Christ as Lord and Savior. The second reason why God is the only master worth serving is because God has superior wisdom and understanding. God is the only one in creation that truly knows what is Good and right. In our first scripture, we see clearly that Jesus has a different take on the Law than the Pharisees and the Hebrew Leaders. You see, the Hebrew Leaders and the Pharisees used the law to enslave the Hebrew people. That may sound harsh, but they used their position and God’s law to become the masters of the people who worshipped God. Jesus, would not call the Pharisees and the Hebrew leaders “master.” In fact, when they Lorded God’s law over the people, Jesus did not follow them. Jesus as God incarnate was able to do what was good by serving God as master and not the power-hungry Pharisees. Because Jesus followed God as master, and not the Pharisees, he was able to heal people on the Sabbath! Jesus was also able to feed the Apostles on the Sabbath. If the Pharisees had been Jesus’s master, The Apostles would have gone hungry, and the man with the damaged hand would not have been healed. The Pharisees were interested in serving their own power. Well, their own power turned out to be a lousy master. It caused the Pharisees to minimize the good things that God had in store for people. If we are like the Pharisees, and allow our need for power or anything else we need or want to be our master, we are in trouble. Also, like most of the Hebrews at the time, if we allow other people to be our master instead of God, well, we are also in trouble. God is the only master who is looking out for the best interest of us all because God is the only one who KNOWS what is best for us all. Because God is good, God knows in every situation what is acceptable and what isn’t. God’s superior wisdom and understanding is another reason why he is the only master worth following. The third reason why God is the only Master worth serving is because God has all the power. This for me is the most convincing reason. That is because, following God and telling people about God’s Salvation in Jesus Christ are hard things to do! I know that I don’t have the power to do it. This world can be a tough place, and often makes me feel powerless. But I never doubt that God has the power to make everything work out for the good. But Think about what Paul says in the scripture this morning. “we have this treasure in jars of clay to show that this all-surpassing power is from God and not from us.” That is why, Paul can continue to follow God as master, even when he is struck down and hard pressed! Because God has the power, and that power shows up in us, fragile humans when we choose to serve God, even in our broken state. When we choose to serve God and try to make disciples even when it costs us, God’s power shine out! As Jesus says in the great commission, “All power and authority has been given to me.” God has all the power, and that is a reason God is the only master worth following. It is very tempting in this world for us to pick a master that promises to deliver what we want. That master might be the bank, who has the power to give us money, or money itself. Money can buy happiness. At least in the short term. But it can’t buy Joy. In fact, the power of money is limited. 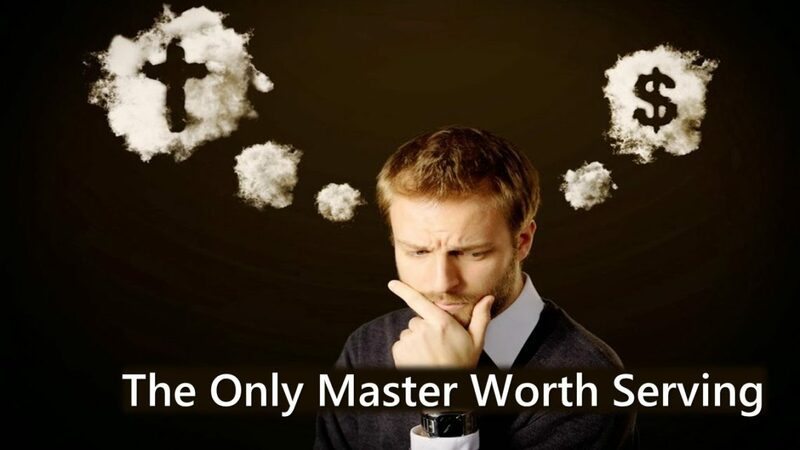 I would rather have a master whose power is unlimited and can actually bring me joy and life to the fullest. It might also be tempting to follow another human as our master. Especially if the person seems godly. Someone who can look out for our interests and tell us what we need to do. Then we don’t have to think much about what to do or take responsibility for our own choices. But even the wisest human master doesn’t know what is best like God does. I would rather follow God as master, because of God’s superior wisdom and understanding. We might want to choose power, or status, or reputation to be our master. That’s what keeps us mowing the lawn twice a week. So we can be seen as a good neighbor who has things in order. But even the status, power, and reputation of a King or Queen are not worthy masters. That is because these things seem good and make life easy, but only God is Good. And I want to serve what is good. Not only what is easy. We may live in the free nation of America, but we all must choose to have a master that we follow. Today’s scriptures remind us that it is hard to follow God in this world. When we follow Jesus, like the Apostles did, the world punishes us, it is extremely hard to let God be our master. In fact, it is very attractive to let other people or things be our master and not God. But always keep in your heart that God is the only master worth following.